Sweet, gooey, crispy, delicious, warm, blueberry dessert. Add a scoop of ice cream just before serving. Yum! Combine the blueberries, 2 tbsp. brown sugar, 1½ tbsp. lemon juice, 2 tbsp. flour and mix. Scoop into an 11 x 7 baking dish. Combine ⅔ cup flour, ½ cup brown sugar, oats, and cinnamon, and cut in the butter and mix with your hands until crumbly. 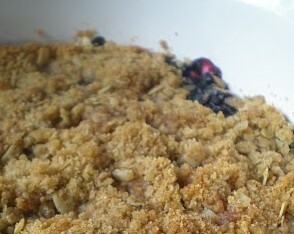 Crumble over the blueberry mixture.